Royal Doulton dates back to 1815 when John Doulton became involved in a pottery in Lambeth, London. 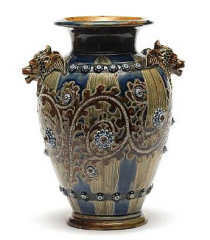 John’s son Henry joined the firm in 1835 and the business expanded rapidly producing chemical and industrial ceramics. The success of their sanitary ware business enabled Henry Doulton to attempt more artistic interests. In 1867 he employed George Tinworth to establish an art pottery in Lambeth. The company offered work to designers and artists from a local art school and included the Barlow family (Florence, Hannah, and Arthur), Frank Butler, Mark Marshall, Eliza Simmance, and George Tinworth. Tinworth’s work especially achieved great public attention and the firm grew substantially to employ 300 men by the 1880s. In 1882, Doulton purchased the small factory of Pinder, Bourne & Co, at Nile Street in Burslem, Staffordshire, which placed Doulton in the region known as The Potteries. Royal Doulton figurines were first launched in 1913 when Darling (pictured right) modelled by Charles Vyse was named by Queen Mary during a visit to the factory. Since this date over 3000 different figures have been produced in variety of subjects from the traditional ladies to clowns and wizards. Charles Noke was the man behind revitalising the Staffordshire figure modelling tradition in the 1890s. However, the early models met with limited success. 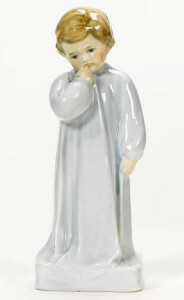 Today, Royal Doulton figurines are famous the world over continuing the excellent work first started by George Tinworth. NOTICE – This site is not affiliated with Royal Doulton plc TM. The purpose of these pages is to provide information to collectors of Royal Doulton figurines.